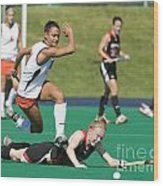 There are no comments for Field Hockey Hurdle. Click here to post the first comment. Virginia Cavaliers midfielder Paige Selenski (21) hurdles Maryland Terrapins Emma Thomas (7). The #1 ranked Maryland Terrapins defeated the #10 ranked Virginia Cavaliers 4-3 in overtime in NCAA Field Hockey at the Turf Field on the Grounds of the University of Virginia in Charlottesville, VA on October 4, 2008.